Florida is on the verge of becoming the 15th state to arm teachers after Gov. Rick Scott signed an omnibus bill Friday allowing school staff to undergo law enforcement training to carry guns in the classroom. Although the notion may seem radical, at least 14 states already arm teachers, according to a VICE News review of state laws and interviews with education department officials and school board associations around the country. Those states are Alabama, Arkansas, Colorado, Idaho, Indiana, Missouri, Montana, Ohio, Oklahoma, Oregon, South Dakota, Texas, Utah, and Washington. Another 16 states give local school boards the authority to decide whether school staff can carry guns, either explicitly or through legal loopholes, but officials said they didn’t know of any instances of armed teachers in those states. In some Texas and Utah school districts, teachers have carried guns for more than a decade. But the majority of school districts that arm teachers have done so in the years since the 2012 mass shooting at Sandy Hook Elementary School that left 26 people dead, including 20 young children. Texas was one of at least eight states where lawmakers passed legislation after Sandy Hook to clarify or relax existing law to make it easier for school districts to arm teachers. The others include Indiana, Georgia, Kansas, Missouri, Ohio, Oklahoma, South Dakota, Tennessee, and Wyoming. And now Florida. The idea of arming teachers in order to prevent or halt school shootings gained renewed scrutiny in the state after a gunman killed 17 people at a Parkland, Florida, high school last month. President Donald Trump and the National Rifle Association both advocated the idea, sparking virulent opposition from teachers unions. Scott signed the bill, which includes a provision allowing certain members of school staff to undergo law enforcement training. The Coach Aaron Feis Program, named for the coach who died trying to protect students at Marjory Stoneman Douglas High School, comes at a price tag of $67 million. The legislation also includes firearm restrictions such as raising the minimum age of purchase to 21 from 18 and creating a three-day waiting period. A NBC/ SurveyMonkey poll released this week found that 42 percent of Americans agreed with the idea of arming teachers, including 80 percent of Republicans, while 88 percent of Democrats and 64 percent of independents said they opposed it. 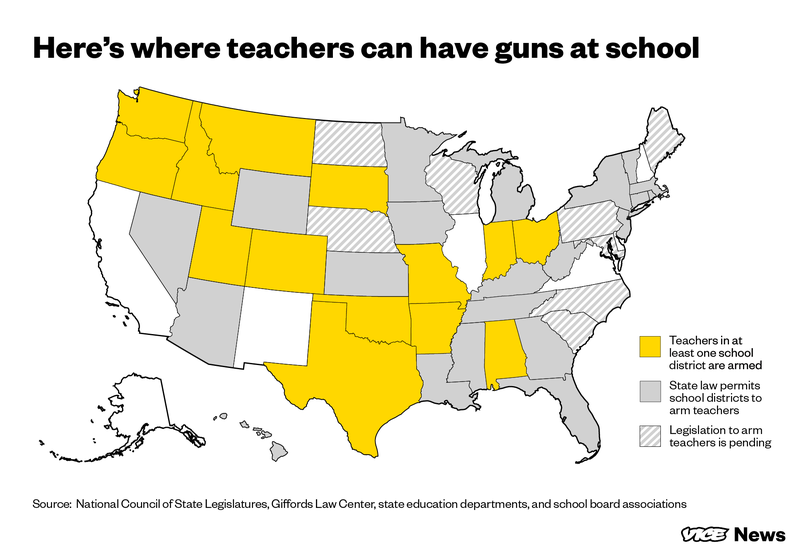 The decision to arm teachers remains largely a local one, and it’s difficult to say how many teachers are armed even in the states where it’s allowed. That’s because school districts generally don’t have to report that information to state education authorities (Arkansas, Texas, and Missouri are the exceptions). And because the question of arming teachers is a sensitive school security matter, the votes often take place in executive session and behind closed doors. Texas education officials told VICE News that they were aware of 172 school districts (out of 1,031 in the state) that currently arm teachers. In Arkansas, a spokesperson said there were 13 school districts (out of 288) where teachers are currently armed. In Missouri, there are at least 20 (out of 567). Officials generally declined to give the names of school districts that armed teachers, though some have received news coverage. In Arkansas, officials in the Clarkesville School District told local media at the time of their decision in 2013 that arming teachers was a more cost-effective solution to improving school safety than hiring a school resource officer. A school resource officer would have cost the district about $50,000 a year, whereas training 13 school staff members to use a gun in a crisis cost about $68,000 in total. In Kansas, the 2013 law allowing teachers to carry guns hit a road bump when the liability insurance provider covering most state school districts wrote a letter saying the company would deny coverage if guns were allowed in the classroom. In Wyoming, no school districts arm teachers today, but a spokesperson for the department of education said at least five are actively considering it. In other states, school districts appear to have taken advantage of existing loopholes or provisions in state law to arm teachers following Sandy Hook. And in a handful of states, laws governing guns in schools appear to be open to interpretation. Legal experts from the National Conference of State Legislatures recently parsed the relevant statutes governing guns in schools. In some instances, they drew conclusions about what the law allows that were different from what state officials told VICE News. For example, the researchers found nothing in Colorado state law that would make it legal for teachers to carry guns in schools or that would give school boards the authority to let them. Yet a spokesperson for the state’s department of education told VICE News that the decision was “up to individual school districts.” One school district in the state that arms teachers is Hanover, located east of Colorado Springs, according to Jeremy Meyer, the department’s director of communications. Louisiana is another example of a state where the law is vague. Scott Richard, executive director of the Louisiana School Board Association, said his organization’s legal counsel is of the opinion that “local school boards cannot make this decision at the local school board level.” Yet the relevant statute says anyone “having the written permission of the principal” can bring a gun to school. Louisiana is one of 19 states with legislation pending that would either clear up confusion over existing laws on arming teachers or amend the law to give local school boards the authority to decide.